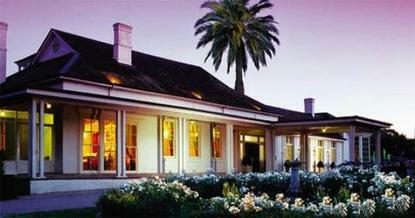 Chateau Yering Historic House Hotel a restored Victorian mansionsurrounded by beautiful Heritage Listed trees is located in theheart of the Yarra Valley. Victorias premier wine growing region..An easy one-hour drive from Melbourne the multiple award winningfive star property features twenty luxury suites individuallydecorated with antiques and fine furnishings. Each accommodationsuite boasts magnificent views from private balconies or verandahsmarble bathrooms with deep clawfoot baths in the River Suites orrelaxing spa baths in the Stable Suites and Yarra Suites and thesumptuous Yering Suite. A swimming pool/tennis court/petanque/country walks/cosy guest lounges with open fireplaces and a Clarinsbeauty room add to the relaxing and charming atmosphere atChateau Yering..Breakfast and light meals are available in the Sweetwater Cafewinner of the American Express Cafe Award for the Best New Out ofTown Cafe 1999. The elegant restaurant Eleonores provides theultimate in fine dining and was recognised as the Best New Out ofTown Restaurant 1998 by The Age Good Food Guide. Sunday afternoonsat Chateau Yering are celebrated in a traditional manner with HighTea served in the drwing room. Bookings are essential for thiselegant event which recreates the graciousness of the Victorian era.The menus in both Eleonores and the Sweetwater Cafe are designedto reflect the seasons and are skillyfully devised by executive chefGary Cooper with local Yarra Valley wine available from the orginalstone cellar at Chateau Yering..Chateau Yering offers superb rural views and luxurious surroundingsthe ultimate destination for lovers innovative of food and wine.Aptly described as -The Jewel in the crown of the Yarra Valley-Chateau Yering is five star indulgence for all five senses.